I was flying back to Virginia after having a great visit with my family in Buffalo during Thanksgiving weekend. My flight was delayed 25 minutes. As soon as the people on the plane before us unloaded we were ushered on at 7:25 p.m. As we took off the captain announced that we would be experiencing bad turbulence, there would be no beverage service, and we would have to keep our seatbelts on the entire flight. All 50 seats on the plane were filled. I was sitting in row 10 in the window seat next to the right wing. About 15 minutes into our one-hour flight I heard a noise that sounded like a car backfiring, but thought nothing of it. A German Shepard puppy towards the back of the plane started to whine and bark. The gentlemen next to me said something is wrong; we have been flying low at the same level like a train on a track. I told him the pilot was probably trying to adjust to avoid turbulent spots. The man replied no, we are flying unusually low. I looked out the window and saw that we were hovering over water. My seat had been reclined when suddenly the stewardess came up from behind me and forcefully pushed my seat forward. I asked her what was going on and she curtly replied that the captain would be addressing us shortly. I was like what the heck is going on?! That’s when I started to panic. 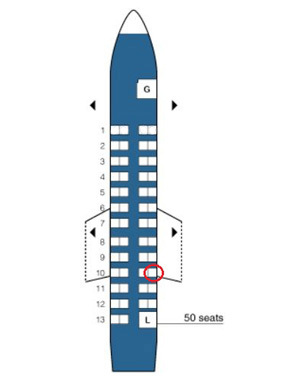 I looked up towards the front of the plane and saw the stewardess take out a large binder, begin to page through it and appear to give instructions to the passengers in the front rows. Next, the captain announced that the right engine had blown and we would have to make an emergency landing. He went on to say that we were turning around to try to land at the Buffalo Airport and that as we approached the airport we would be followed by fire trucks. That explained the puppy’s odd behavior – it must have sensed something was wrong either by the strange sounds the plane made when the engine blew and/or the fear emitted by the crew members before the captain announced what was happening. We were instructed to brace ourselves. I held on to the seat in front of me. We unsteadily landed on the runway. All of us unloaded off the plane very quickly down the stairs. Everyone stood around outside in shock and confusion. I turned around and saw the pilots come out of the cockpit — their faces were pale and they immediately got on their cell phones. I thanked one of the pilots for his efforts to land us safely. He said thank you, this is what we train for. After we made our way inside the airport they announced that no more flights would be going out that night, which was fine with me because there was NO Way I was getting on another plane at that point. For those who didn’t need hotel accommodations they told us to call a toll-free number to rebook our flight. I was going to rent a car and drive home, but my cousin who I had called said I should rebook and try to fly out the next day because it would help squash my fears and what were the odds that the same thing would happen on another flight a couple of hours later. Luckily 0! Since the flight was only about an hour long, I pushed my fears aside and got on a plane the next morning. I arrived safely at Dulles Airport and kissed the ground. I hope to never go through anything like that again. You have to completely trust the skills of the pilots who literally have your life in their hands and hope/pray for a positive outcome.